Custom Embroidered Ladies Business Woven Shirts, wrinkle free, stain release, non-iron, twills, oxfords, button down shirts. Custom embroidered ladies woven business shirts. Custom embroidered twills, oxfords and performance fabrics that include wrinkle free, non-iron, wrinkle resistant and stain release. Ladies styles just don't get much better! Brands such as Port Authority, Harriton, Devon & Jones and Van Heusen fill this page with popular custom embroidered ladies styles that are sure to make a wave at your business office or event. Custom embroidery is included in price. 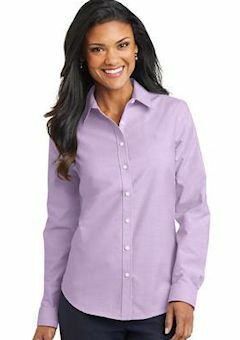 Custom embroidered Port Authority® - Ladies Long Sleeve Easy Care Woven Business Shirt. 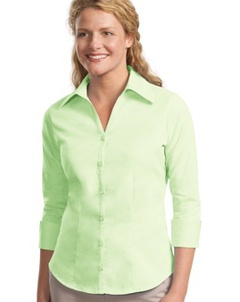 L608 This wrinkle resistant shirts are a cut above the competition so you and your staff can be, too. A comfortable, wash and wear shirt is indispensable for the workday. 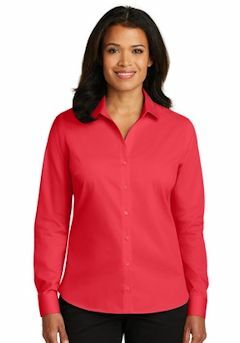 4.5-ounce, 55/45 cotton polyester, Dyed-to-match buttons, Box back pleat, Adjustable cuffs on long sleeve styles, Tailored for a smooth feminine fit, Open collar. Custom Embroidery included. New to OMD's featured site. Custom embroidered M500W Harriton Ladies' Long-Sleeve Twill Shirt with Stain-Release Business Shirt. Harriton has proven to be one of our best selling custom embroidered brands so we thought this was a great addition. 55% cotton, 45% polyester with stain-release; extra stitching at seams and buttons; flat-felled seam finishing; signature horn-style buttons with Harriton logo; darts and princess seams; two-button adjustable cuffs; spread collar. Great for Business or Office. Custom Embroidery included. Custom embroidered M600W Harriton Ladies Woven Oxford Business shirt With Stain Release. Outstanding value! 65/35 cotton/poly oxford with stain release. Pearlized buttons with Harriton logo. Extra stitching for strength at seams and buttons. Flat felled seam finishing. Darts and princess seams. Custom embroidery included. A heavy hitter in performance, our SuperPro Twill Shirt easily resists stains and wrinkles while releasing stains. 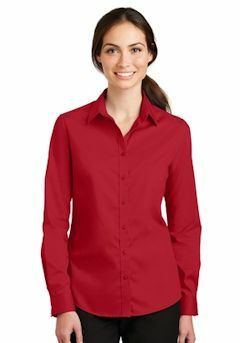 Designed for comfort, this versatile shirt functions well in almost any work environment from the office to food service. 3.4-ounce, 55/45 cotton/poly. Open collar. Bust darts. Back yoke with side pleats. Dyed-to-match buttons. Button-through sleeve plackets. Two-button adjustable cuffs. Shirttail hem. Custom Embroidery Included. Look your best in a tried-and-true oxford that performs. Proven in independent lab tests to resist soil and release stains, our SuperPro Oxford has a soft hand and a wrinkle-free finish to keep you looking neat and professional all day long. 4.6-ounce, 60/40 cotton/poly. Gently contoured silhouette. Open collar. Bust darts. Back yoke with knife pleats. Button-through sleeve plackets. Two-button adjustable cuff. Custom Embroidery Included. 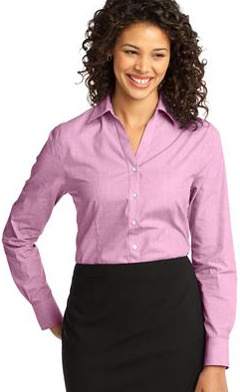 A custom embroidered Port Authority ® - Ladies 3/4-Sleeve Open Neck Woven Business shirt. L6290. 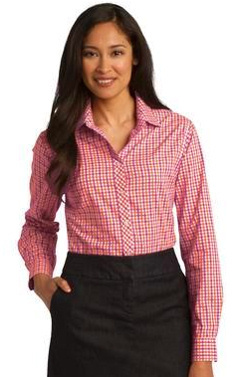 Crisp tailoring and an irresistibly feminine shape give this blouse professional grace, but a fun side, too. 4.5-ounce, 55/45 cotton/poly, Gently contoured silhouette, Dyed-to-match buttons, Front and back darts, 3/4 sleeves with fashion cuffs. Custom embroidery included. A not-too-bold plaid pattern offers a welcome break from a solid color. Designed for comfort and wrinkle-resistant convenience, this yarn-dyed poplin shirt is ideal for both dress and casual wear. 3.2-ounce, 55/45 cotton/poly. Gently contoured silhouette. Open collar with Y-shaped slim placket. Pearlized buttons. Front and back darts. Button-through sleeve plackets. Cuff notch with two buttons on cuff. Custom Embroidery Included. A fresh alternative to a solid-color shirt, our gingham check pattern is office-ready. Crafted in an Easy Care blend, this poplin style resists wrinkles and features bias-cut details inside the collar stand and inside the cuffs. 3.2-ounce, 60/40 cotton/poly. Gently contoured silhouette. Open collar. Bias-cut details on placket and back yoke. Bust darts and back princess seams. Button-through sleeve plackets. Adjustable notched cuffs. Custom Embroidery Included. 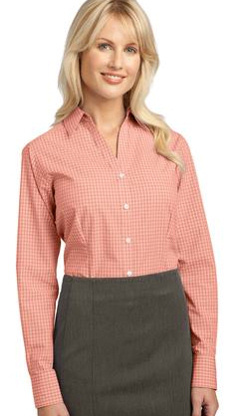 With a beautiful two-color weave-not to mention wrinkle resistance-this poplin shirt has a pleasing texture and truly impresses in the office. 3-ounce, 60/40 cotton/poly. Gently contoured silhouette. Open collar with Y-shaped slim placket. Front and back darts. Pearlized smoke buttons, pearlized white buttons on Chambray Blue, Navy Frost, and Pink Orchid. Adjustable, button-through sleeve plackets. Notched cuffs . Custom Embroidery Included. 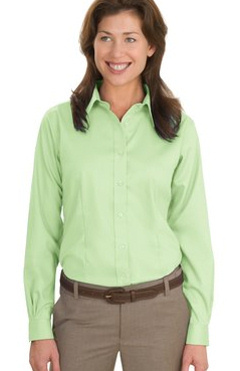 Custom embroidered Port Authority ® - Long Sleeve Ladies Non-Iron Twill Woven Business Shirt. L638. Stunning for casual or corporate this Non-Iron Twill Woven Business shirt with your custom embroidered logo is well worth the money. With the same non-iron finishing treatment as more expensive brands, our non-iron twill shirt helps you keep your sharp looks-at a real value. Crafted from special 40-singles compacted yarn for enhanced softness and comfort, this shirt will keep you professional looking long past 5 o'clock. 4-ounce, 100% cotton, Open collar, Dyed-to-match buttons, Front and back darts, Custom embroidery included. Always look your best-without the iron-in this elegant twill shirt crafted from a blend of cotton and polyester yarns and treated with a non-iron finish. With supreme color retention and uncompromising style, it is also an exceptional value. Features an open collar, bust darts, inverted center back pleat and gently curved hem. Button-through sleeve plackets with adjustable, notched cuffs, Red House engraved buttons and monogram on right sleeve placket. 3.4-ounce, 55/45 cotton/polyester. Custom embroidery included!